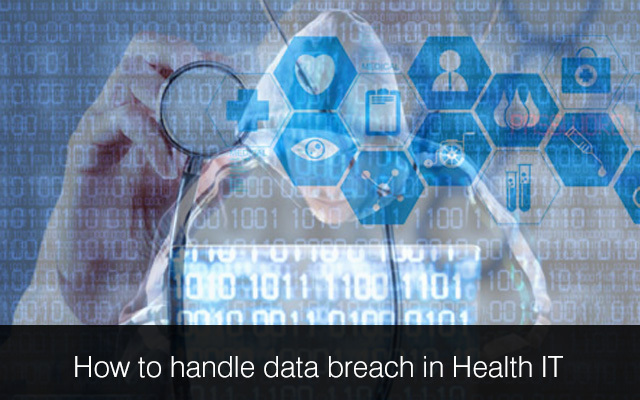 Data breaches in health IT has become a very common phenomenon. According to latest survey reports released, nearly 94% healthcare organizations have faced this issue some time or the other in the last couple of years. With more information being fed into electronic systems over a period of time, it has become even more important to maintain the confidentiality of private patient data and with that, the prospect is becoming quite challenging as well. There are no cures for this as you cannot totally stop it. But you can take some steps which might provide some element of safety to your system which might make it difficult for people to access the information, proving to be a hindrance. Knowing it whenever that happens- It is very important to maintain regular check ups to ensure that whenever a breach happens it is duly noted. Notice the rate in which it is happening. Remember that it is important to know when it has happened; if initially it is ignored then later on, more serious breaches can take place and then it would become a blaming game as noticing as well as taking suitable precautions would have prevented it from happening. Taking inventory of PII/PHI- Through proper inventory you get total accounting of each element of PII or personally identifiable information and PHI held by an organization in either electronic or paper format. Through this you will be able to determine the PHI that is collected, used, stored as well as disposed by an organization. Risk for breach of data is revealed by this so that PHI data can be strategically protected with best plan formulated for response according to real information. Developing an IRP or Incident Response Plan- An effective as well as cost-efficient way of helping organization meet the requirements of HITECH and HIPAA is an IRP which helps in the development of guidelines that are related to incidents of security breaches. Roles are designated by IRP by providing guidelines for the actions as well as responsibilities of response teams. Knowing the definition of incident and actual breach- Go through federal and state laws to find out which kinds of information can be disclosed to the affected patients or their relatives. This will help you determine which is just an incident and which is an actual breach. Learn about the balances so that you can balance it out. Reviewing agreements as well as contracts with business associates- One of the growing causes of data breaches can be said to be business associates. The PHI of an organization is used as well as shared by healthcare providers along with the business associates. The contracts between the two parties define the usage. When the contracts are kept up-to-date, it helps maintain consistency of PHI management in healthcare ecosystem. Determining how and who to notify- Determine these segments which will help in a quick as well as correct response. In case of minor information leak, the related patient may not have to be informed. But in case of a big incident, it is best to inform the relevant people. Widen the response team- Employ an initial response team and engage the team’s various resources. The breach may need a wider set of people, including both external as well as internal resources. Keep everything well-documented- Maintaining good documentation is a key to everything. The institution’s profile may need higher authorities getting involved, so it is better to prepare your ground well. Security rift may result in a lot of harassment, harm, stress and frustration to the related parties. So it is essential for the health organizations to act tough and put their foot down when it comes to maintaining the privacy of their patient information. You can get in touch with healthcare software development companies to get your software developed. There are companies which have the expertise to develop electronic medical records and other healthcare softwares. If you would like to hire emr software developers from such a company, we would be glad to assist you at Mindfire Solutions. This Post was posted in Health Care and tagged develop ambulatory healthcare system, develop clinical information management systems, Develop Electronic Medical Records, develop physician cpoe systems, EMR EHR Software development, emr software developers, healthcare mobile app development, healthcare software development, iphone medical app developers, mobile health app development. Bookmark the permalink.